How well do you know the history of Christians who have had a big impact for the Lord? Most of us have heard of D.L. 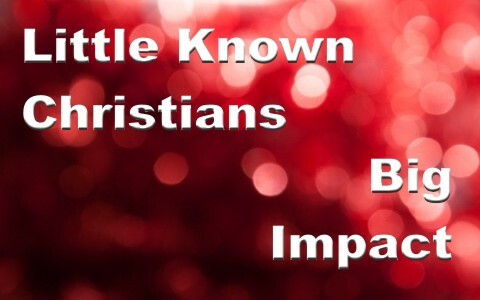 Moody, Jim Elliot, Jonathan Edwards, Billy Graham, Corrie ten Boom and the like but what about those who have had an impact and are nearly forgotten, I have highlighted just 8 little known Christians in the list below. Peter Waldo was a wealthy Frenchman, yet he often sold his things and gave the money to the needy. He practiced Biblical principles in his life and believed that the Bible held the only true measure of faith. He and those with whom he co-labored preached in pairs. He and his followers were known as “The Waldenses”. They were well versed in the Scriptures and memorized many, many passages. During his life it was popular to believe in purgatory but he did not. Nor did he believe it was necessary to attend “mass” because prayers said at home were just as effective as those said in a church. The Waldenses grew so large that the Roman Catholic felt threatened and therefore they started the Dominican and Franciscan Catholic orders to oppose the Waldenses – they failed. This was a brutal time in the history of the Roman Catholic church. It was the time of the great Inquisition which was begun to try the Waldenses for heresy; the object was to kill them. However in Southern France, the Inquisition failed because there were so many Waldenses. Instead the Roman Catholic armies invaded the South of France to attack and kill the Waldenses. The war went on for 20 years until eventually the Waldenses fled to the high valleys of the alps. Even today you can find Waldenses in this sanctuary land. 1) The Church consists of all people who are saved. 2) Christ is Head of the Church, not Popes or Cardinals. “An indulgence is obtained through the Church who, by virtue of the power of binding and loosing granted her by Christ Jesus, intervenes in favor of individual Christians and opens for them the treasury of the merits of Christ and the saints to obtain from the Father of mercies the remission of the temporal punishment due for their sins.” The Church does this not just to aid Christians, “but also to spur them to works of devotion, penance, and charity” (CCC 1478). For this Huss was excommunicated, or thrown out of the Catholic church. Huss made it very clear and spoke against Pope John declaring his excommunication of no importance and, in fact, acted as though it never even happened. Pope John declared Huss as a heretic and threw him in prison. Many protested against the arrest of Huss, including the Emperor. Even so the Pope used his power for evil, cursed Huss and eventually ordered him to be burnt at the stake. Zwingli was from Switzerland and he was another brave man who spoke out against the sale of indulgences. He believed the mass was unbiblical as well as altars, statues and other relics that were found in the church. He could not support the teaching of transubstantiation because he believed that at Communion, or the Lord’s Supper, the bread and grape juice symbolized Christ’s body and blood — it was not the literal body and blood. He died in battle in 1531. Cromwell led English independent Christians in civil wars against Charles I who wanted to get rid of the Puritans after Queen Elizabeth died. He and his soldiers (more than 20,000) where known for going into battle singing psalms. They did regular Bible studies while engaged in war. They were never defeated and the King eventually surrendered. Nicholaus, the Count of Zinzendorf was of ancient noble decent. He was born in Czechoslovakia, in 1700. He was moved for Christ when as a child he saw a picture of Christ on the cross saying: “This I did for you. What do you do for me?” He was so impressed by this that he started a club to teach and encourage others to strive for personal holiness and evangelism. He was only 10 years old. When he was 15 he and his classmates promised on every occasion to confess Christ and to seek the conversion of men. He bought a large area of land near Dresden. In 1722 he sought to help a group of persecuted wanderers led by Christian David and so he allowed them to settle on his land. This group was known as the Pietists (a movement within Lutheranism). They would later become known as Moravians. Zinzendorf challenged this group of about 300 people to be soldiers for Christ and to evangelize the world. These Moravians put into action the Great Commission. They were active and instrumental in founding missions in places like Africa, Asia and Greenland. They even ministered to the American Indians. It is said that a Moravian asked Wesley if he knew Christ; this gave Wesley a desire to be saved. Not much is known of Martyn only that he was a brilliant mathematician at Cambridge University. We was called to India and obeyed God. He is best known for his contribution in translating the Bible into the languages of Hindustani and Persian. He died young at the age of 31. Several years after his death his letters and journals were discovered. His records inspired many to obey the call to missions. Even less is found on Krapf. He was a missionary to Kenya and is known to have reached some eight mission people. He lost his wife and newborn baby to fever. He studied many languages and spent time exploring East Africa. He is responsible for translating the New Testament into Swahili. Mary was born in Scotland and was basically uneducated. Even so he became a Sunday School teacher and a mission helper. She was an ordinary lady and she answered the call to spend her life amongst a land filled with tribal people who were constantly at war in West Africa. She was fearless and dedicated in her work with the people and they loved her for it. Her skills in medicine and language and her uncanny sense of humor made her particularly endearing to these savage people. She shared the gospel with the people and it spread far and wide. She was vehemently against slavery. After a life of hard work she died at age 66. This Scottish missionary established missions very much like we see as the pattern of Paul in the Bible. He concentrated his efforts in Malawi and Tanzania. He made sure to that nationals were raised up and ordained as Pastors and was responsible for establishing over 700 primary schools throughout the 60,000 member Christian community. As was the case with the Apostle Paul, Robert planted Bible believing churches that became self-supporting and evangelistic with national pastors. I have just scratched the surface of little known Christians who had a big impact throughout history. You may or may not agree with these that I have chosen so take the opportunity to share your thoughts and picks in the comments section below. Next post: What Is The Spiritual Gift of Administration? How Do You Know If You Have It?